I am not sure why the above reviews are less than 3 stars (maybe they are pickier than me). Anyway, I am not a games, but type all day and this keyboard is the most awesome keyboard of all time to me. I have the blue cherry switches. Also, I dropped the keyboard down 18 wooden stairs and it hit everyone of them and works perfectly fine. Excellent build quality!! I've had the keyboard for almost a month now and haven't had any big issues. The only issue I'd note is that the keys that are supposed to be grey are more of a greish-brown tent. It still looks decent with my setup, but isn't the same as advertised. Very pleased with this board and MK's service. After a long search for my first mech, I took some advice from local mech communities and went with this Ducky One. I won't go into all the details, because if you're hear, you've probably whittled down your decisions. Pros: PBT keycaps feel excellent and solid. Very solid. I've noted some very minor dye problems where some legends appear a bit fuzzy, but I've got to be staring at it to really see it. The board is hefty and solid, even though it's plastic. Excellent to have micro USB connector for easy detachment. I love love love the minimal extra keys (vol up/down, mute, calculator). I use the 10 keypad primarily for finances, so having a quick calculator key is awesome. Cons: I really don't have many. As noted above, some of the keycaps aren't perfect. For being an entry-level mech board, I don't see this as an issue. You have to really inspect it to see the differences in keys. 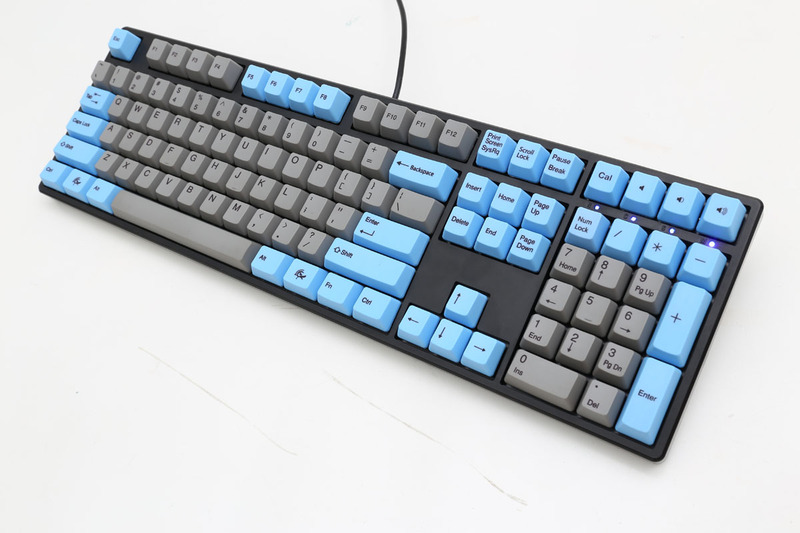 I do wish the blue keycaps were a bit brighter, as the photos above can be just a tad misleading. Not a major issue though. Really love this board as my first entry back into mechs after a decade or so without. This most likely won't be my last mech, but I am extremely satisfied. MK shipping was nice. Keyboard was adequately packed to protect it. Shipping wasn't phenomenally fast, but it was good. Overall, very pleased. Will most likely shop with MK again. 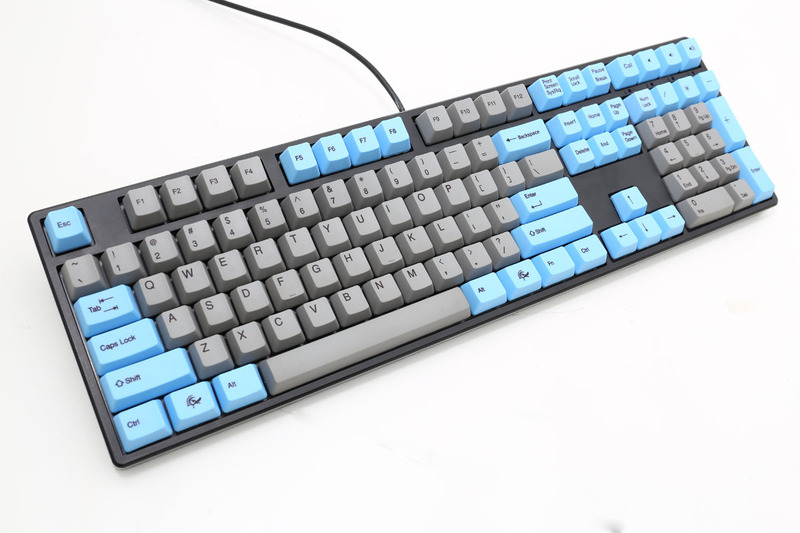 After extensive research and no prior knowledge on mechanical keyboards I decided to purchase this ducky keyboard. I expected this keyboard to last a fair amount of time considering the fact that it has cherry switches and PBT Keycaps. While I am satisfied with the quality of the switches so far, I wish I could say the same about the keycaps themselves. I was under the impression that PBT lettered keycaps were one of better ways to manufacture keys, Maybe I was wrong? Maybe the keyboard I received did not have legitimate PBT lettered keys? Ive had the keyboard for a little over a month now and the WASD keys are already starting to fade. Would not recommend purchasing a ducky keyboard. Nice keyboard! The caps feel great and I feel that ducky makes great high quality products. The switches feel great, gotta love cherry mx!